Dialogue platform CircleLytics was founded with a clear vision: help groups of people to unleash their collective intelligence, increase trust amongst each other, and make meaningful impact, together. Our strategy is to offer our platform as SaaS subscription to organisations and employees. Partners, such as a consultants, apply our platform in their work to help organisations change, innovate, transform, work more efficient, and many more. 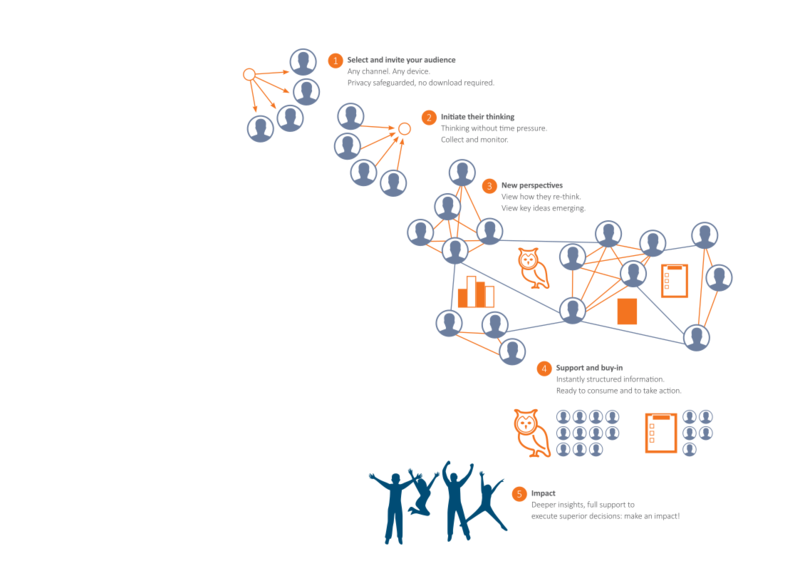 CircleLytics facilitates the user (=organization) to engage groups of 10 up to 100,000s of employees in a variety of topics. Via clear-cut questions, the topic is put to the group. The group responds in multiple, anonymous, subsequent rounds. This way they’re inspired, they reflect and re-think, which brings out a untapped level of creativity and collaboration. Contact us for a demo or start your subscription today. We apply group dynamics, psychology, neurology, collective intelligence, gamification, and machine learning to (further) develop our unrivaled platform. This way, we extract a tremendous amount of actionable insights from the data we collect. Our platform is SaaS-based, frequently pen-tested, secures privacy and protects data with the highest standards. CircleLytics is applied as stand-alone solution or integrated in your app or HR platform. Our APIs are well-documented, integration can be done swiftly. Participants in dialogues via CircleLytics don’t need to download anything, and we’re responsive for any device, via any browser. We believe employees come first, to win any challenge you’re up against! Employees drive your company’s daily performance, risks and growth. That’s why. Contact us now to learn more, start your pilot today, become a partner!